Last night at the 2018 MUFSO conference gala awards dinner in Dallas, the Aldi supermarket chain was presented with the award for Supermarket News’ Retailer of the Year. The retailer, whose U.S. headquarters is in Batavia, Ill., offers a unique, curated selection of high-quality private label products in a compact store format and attracts customers with hard-to-match, everyday-low prices and a simplified shopping experience that eschews promotional frills. 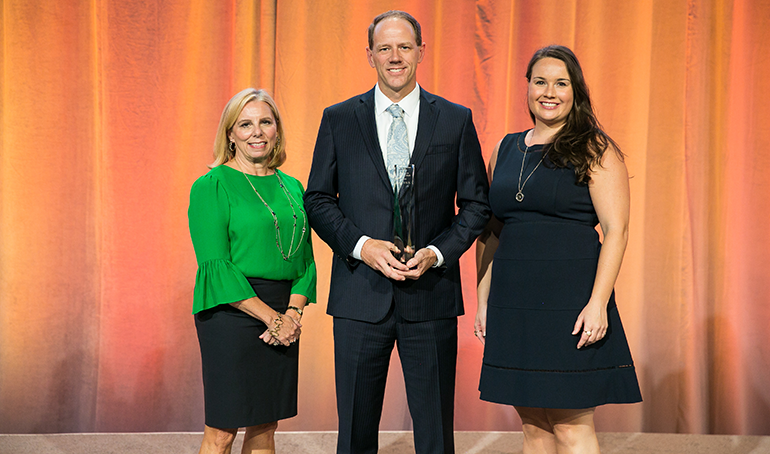 The SN Retailer of the Year award is presented to Scott Patton of Aldi by Supermarket News' Laura Viscusi (left) and Becky Schilling (right). Now with about 1,800 locations in 35 states, privately held Aldi is more than a year into a $5.3 billion, five-year expansion program that will enlarge its store base by almost 50% and upgrade most of its stores. Dovetailing with that initiative is a major product expansion in which 20% of items in every store will be new versus a year ago.